Controversial plans which will see Bristol's Memorial Stadium expanded to an 18,000-seat capacity venue, are to be recommended for approval next week. During a consultation period the city council received 991 letters supporting the scheme and 592 against. Approval of the scheme is dependent on a number of key requirements. These include setting up a residents' parking zone and provision of transport including a park and ride service to discourage fans from driving to games. 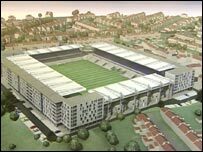 A noise report submitted with the planning application suggested by fully enclosing the stadium, noise levels at the boundary would be reduced. A series of conditions to restrict activities and opening hours have also been proposed, to protect those living nearby. The stadium on Filton Avenue, Horfield is home to Bristol Rovers Football Club and Bristol Rugby Club. Bristol City Council meets to discuss the plans on Wednesday 17 January.